Down Home Cookin' Pine Country Restaurant offers finger lickin' down-home cookin'! 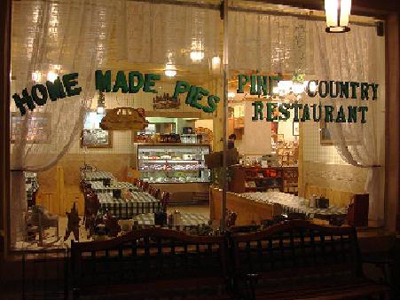 World Famous Homemade Pies Pine Country Restaurant is always baking up a wide variety of fresh, delicious homemade pies. And if you really like coffee... or Chai Tea... You'll love our Giddyup 'n' Go Coffee Bar! All of America's favorite hot & cold coffee beverages are named after cowboys & cowgirls! Try a "Clint Eastwood" - an espresso shot that's "Coffee with Muscle"! Come and enjoy all there is to experience in Williams ... take a look at our "Fun Things to do in Williams" tab and plan to stay a few days! Come to Pine Country and let us show you what small town hospitality is all about!